So I broke my accidental 3 day break from exercise today by doing cardio for the first time this week. All I've done this week is pilates, and my abs are killing me. 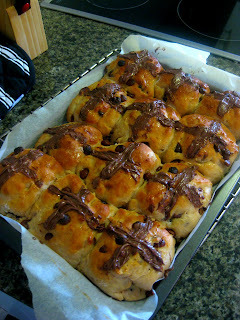 It's a good thing I did too, because then I came home from my run and ate three of these chocolate hot cross buns. I know, how awful. So these buns are not healthy. They are absolutely filled with sugar, and will break your diet. But they are delicious. 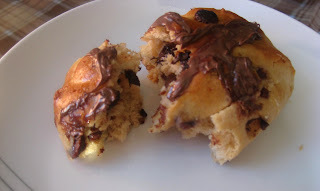 I am actually finding it difficult to find the words to describe how delicious they are - they are moist, the chocolate flavour is not too strong in the buns themselves, but the chocolate chips simply melt in your mouth. I made these early, not just to show you the recipe, but also because my roomates won't be here for Easter. So we celebrated Easter a week early, today. It was fabulous - we sat out on our balcony, opened up our blinds, and ate off our coffee table. We don't have a kitchen table. I know, how awful of me, being a food blogger and all. But we're poor college kids. 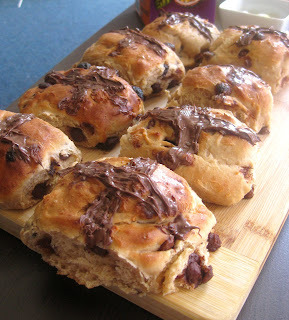 So we had these delicious hot cross buns with juice. And for dinner I made lemon, parmesan and feta crumbed chicken with a pear and rocket salad, and chocolate fondant with caramel easter eggs for dessert. 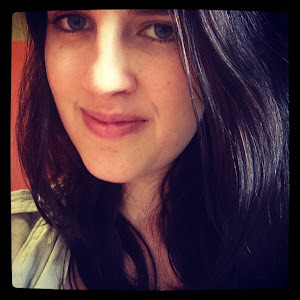 Overall, not the healthiest day. But I plan to eat a lot of fruit, quinoa and fish this week to make up for it. So, about these chocolate hot cross buns. They are a perfect Easter treat - for your kids, for you, for brunch, for breakfast, for a snack; hell, for anytime and anyone. So, while they are not healthy, I promise you the taste makes up for it. Besides, a little bit of chocolate never hurt anyone. Level of Difficulty: I suppose this depends on how you are with bread – probably not for beginners, but I managed to do it ok. Took me a while though. 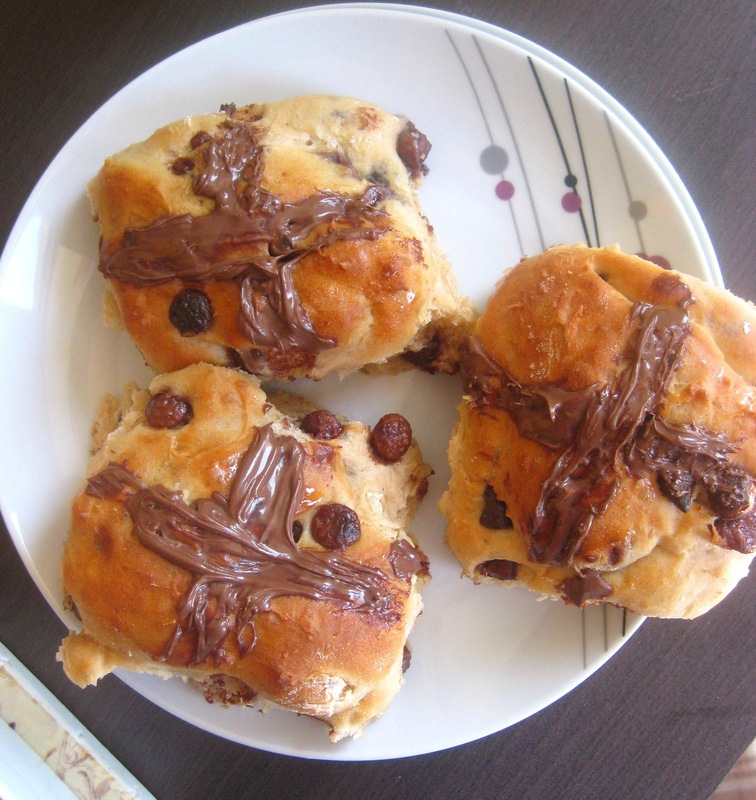 Menu Options: This is a brilliant recipe for Easter. We had ours with cold orange juice, which was amazing, and some Carmello and Malteser eggs. Obviously, as this is an Easter themed treat, you can serve it with anything you want – but we loved having ours as a mini-brunch. I didn’t even bother with a nutritional value for this recipe. We know it’s not healthy. We know it has processed sugar, chocolate and is not made of whole foods. But it is delicious. And you are perfectly welcome to eat chocolate at Easter. Makes 12 hot cross buns. In a large bowl combine milk, yeast, salt and ½ tsp sugar in a large bowl. You have to mix this together well – I prefer to use a wooden spoon. Make sure the yeast is well mixed in. Cover loosely with plastic and leave bowl in a warm spot for 10 minutes or until the mixture is slightly bubbled on top. Mine was not very frothy/bubbly, but I left it for around 12 minutes and there were bubbles on the top of the mixture. In another large bowl, sift flour, cocoa and cinnamon together. Add the 2 tbsp of sugar, frothy yeast mixture, butter and egg. Stir until the mixture comes together. It will be a thick, shaggy dough and very sticky. Turn the mixture out onto a well floured bench. Make sure your hands are well floured. Knead the dough until it is smooth. I had to knead mine for 10-15 minutes. It actually wasn’t working for a while, so if this happens for you, just do what I did – leave the dough for a minute or two and let it breathe. Then, retry. My dough wasn’t perfectly smooth, it was still a little sticky but it stuck together. Place the dough in a lightly oiled bowl (I simply sprayed mine heavily with coconut oil). Cover the bowl with a plastic wrap. Leave the dough in a warm place so the dough will rise. I left mine for about 1 hour 10 minutes, but leave for up to 1 hour 30 minutes if the dough has not doubled in size. Mine doubled very quickly – in fact it rose over the bowl and stuck to the plastic. There is nothing wrong with this, it means you’ve done a good job. I went for a run while my dough was rising. Once the dough has doubled in size, punch it down to its original size with your fist. This is the best bit of the recipe – it’s so much fun. 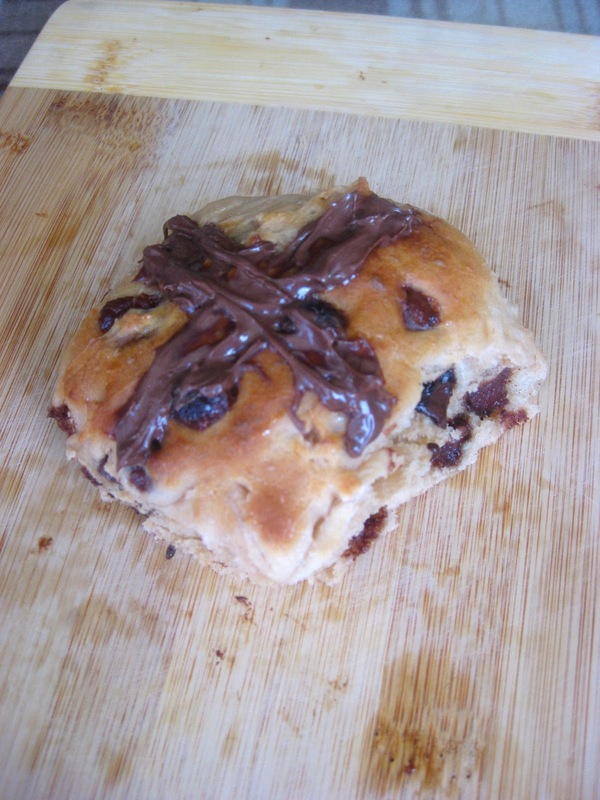 Turn down on to a floured surface and add the chocolate chips slowly, kneading the bread until the chips are evenly spread throughout the mixture. 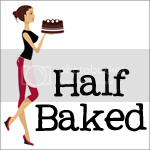 On a tray or in a large, deep pan, divide the mixture into twelve equal portions to make twelve balls of dough. Mine were not perfectly circular – not at all. But it doesn’t really matter, it still looks good. Make sure you place the balls about 1 cm apart, as the dough has to rise one more time. Cover the balls with plastic wrap and leave the pan in a warm place until the dough has doubled in size. This takes about 30 minutes. I left mine for a good 30 minutes. Preheat oven to 200 degrees Celsius. Bake the buns for 15 – 20 minutes. The top of the buns will be a golden brown and when a skewer is inserted into the dough it should come out clean. This may take less time depending on your oven – keep a good eye on it. If you want to glaze the muffins, simply boil the water with the remaining 1 tbsp of sugar for about 3 minutes. Then brush the sugar mixture over the warm muffins. After this, while the muffins are warm, make the crosses. I used a knife and Nutella to simply spread the nutella over the buns to make a cross. Serve warm. You can serve them at warm temperature, but warm, when the chocolate chips melt out into your mouth, is so much better. These buns can be reheated easily. I don’t know how long they last in the fridge, because we ate them all. chocolate + bread = almost too good to be true! :) Thanks - it's not as scary as I thought!